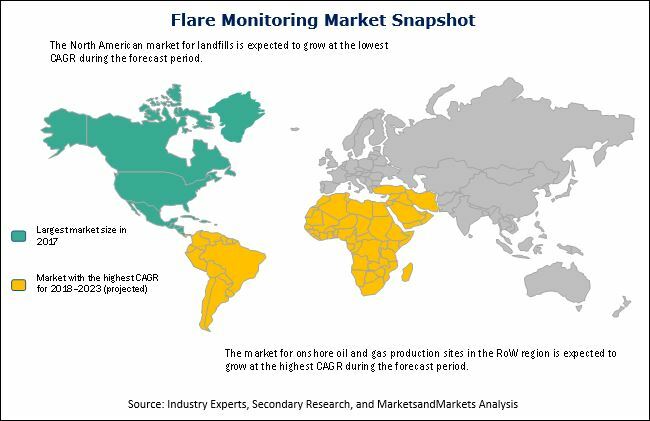 [160 Pages Report] The flare monitoring market was valued at USD 760.4 Million in 2017 and is expected to reach USD 1,251.7 Million by 2023, at a CAGR of 8.24% between 2018 and 2023. The base year considered for the study is 2017, and the forecast period is between 2018 and 2023. The report aims at estimating the market size and future growth potential of the flare monitoring market based on mounting method, industry, and geography. The report also aims at providing detailed information regarding the major factors influencing the growth of the flare monitoring market (drivers, restraints, opportunities, and challenges). It strategically analyzes micromarkets with respect to individual growth trends, prospects, and contributions to the total market. The research methodology used to estimate and forecast the flare monitoring market begins with capturing data on revenues of the key vendors in the market through secondary research. Some secondary sources used in this research study include the Association of Air Pollution Control Agencies, the Air & Waste Management Association, the International Emissions Trading Association (IETA), International Petroleum Industry Environmental Conservation Association (IPIECA), the International Association of Oil & Gas Producers (IOGP), BP Statistical Review of World Energy, the Organization of the Petroleum Exporting Countries, the World Bank Group (GGFR), the U.S. Energy Information Administration, the US Environmental Protection Administration (EPA), the International Forum for Process Analytical Chemistry (IFPAC), the Society for Applied Spectroscopy, the Chromatographic Society (ChromSoc), the American Society for Mass Spectrometry (ASMS), the Canadian Society for Mass Spectrometry, International Mass Spectrometry Society (IMSS), the British Mass Spectrometry Society, and the Scottish Environment Protection Agency (SEPA). Vendor offerings have also been taken into consideration to determine the market segmentation. To estimate the size of the flare monitoring market, top-down and bottom-up approaches have been considered. This entire research methodology includes the study of annual and financial reports of top players, presentations, press releases, journals, paid databases, and interviews with industry experts. All percentage splits and segment breakdown of the market are based on secondary and primary research. The breakdown of profiles of primary has been depicted in the figure below. Major players in the flare monitoring market include Siemens (Germany), ABB (Switzerland), FLIR Systems (US), Thermo Fisher Scientific (US), Honeywell International Inc. (US), John Zink Company, LLC (US), LumaSense Technologies Inc. (US), Zeeco, Inc. (US), MKS Instruments (US), Land Instruments International Ltd. (UK), Eaton HERNIS Scan Systems AS (Norway), Fluenta (UK), Williamson Corporation (US), Extrel CMS, LLC (Pennsylvania, US), Providence Photonics LLC (US), Powertrol Inc. (US), and TKH Security Solutions (Netherlands). The global flare monitoring market is estimated at USD 842.3 Million in 2018 and is expected to be worth USD 1,251.7 Million by 2023, at a CAGR of 8.24% between 2018 and 2023. The flare monitoring market is expected to grow substantially due to the factors such as strictness in environmental regulations to curb harmful emissions and raise combustion efficiency of flare systems, benefits offered by remote flare monitoring systems, and steady expansion of oil, gas, and petrochemicals industries, especially across the Middle East & Africa and Asia Pacific. The growing demand from major oil and gas producing countries across the Middle East & Africa and major oil refining countries in Asia Pacific and Europe are offering new growth opportunities to the players in the flare monitoring market. The flare monitoring market, based on the mounting method, has been segmented into in process and remote. The segmentation on the basis of industry includes refineries, petrochemicals, onshore oil and gas production sites, landfills, offshore, and metals and steel production facilities, among others. The in-process mounting method held the largest market size in 2017, and the same trend is expected to continue between 2018 and 2023. The growth of the said market is majorly driven by the increase in crude and shale oil production, discovery of new oil fields, and continuous demand from refineries, which, in turn, will give substantial impetus to the market for in-process mounting flare monitoring systems in the near future. However, the market for the remote mounting method is expected to witness a higher growth rate. Ease in the process monitoring, lesser price compared to in-process technologies, and compliance with most of the environmental norms are some of the key driving factors for the growth of the market for remote flare monitoring systems. Refineries accounted for the largest share of the flare monitoring market in 2017. This industry is witnessing the largest deployment of in-process and remote flare monitoring devices and systems. However, the flare monitoring market across the onshore oil and gas production sites is estimated to grow at the highest CAGR as the major composition (over 85%) of worldwide gas flaring is done across upstream activities. The growing strictness from regional, national, and international environmental jurisdictions to reduce emissions of harmful VOCs and other pollutants right from the extraction to production of oil and gas is expected to boost the demand for flare monitoring systems across upstream, i.e., both onshore as well as offshore oil and gas production sites in the near future. In 2017, North America accounted for the largest market share, followed by Europe and Asia Pacific, respectively. The US held the largest share of the North American flare monitoring market, followed by Canada and Mexico, respectively. The growth of the market in North America was driven by the growing number of drilling activities and shale gas exploration, coupled with the growing focus on emission reduction from upstream activities. A sstrong requirement for the installation of flare monitoring devices imposed by federal, state, and local agencies are further expected to drive the flare monitoring market growth in North America. Every country has its own environmental regulatory regimes that regulate the emissions from process industries. Adherence to such regulations requires the installation of accurate and reliable flare gas measurement and monitoring devices, which will create ample opportunities for the flare monitoring market players. Technological challenges resulting from the adherence to regulatory norms while bringing down the overall cost of systems is a key challenging factor for the growth of the said market. This report describes drivers, restraints, opportunities, and challenges pertaining to the flare monitoring market. 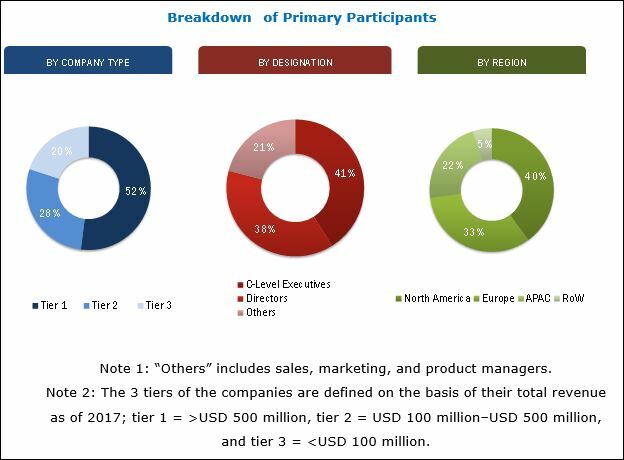 Furthermore, it analyzes the current scenario and forecasts the market till 2023, including the market segmentation based on mounting method, industry, and geography. Some major companies in the flare monitoring market include Siemens (Germany), ABB (Switzerland), FLIR Systems (US), Thermo Fisher Scientific (US), Honeywell (US), John Zink Company, LLC (US), LumaSense Technologies Inc. (US), Zeeco, Inc. (US), MKS Instruments (US), Land Instruments International Ltd. (UK), Eaton HERNIS Scan Systems AS (Norway), Fluenta (UK), Williamson Corporation (US), Extrel CMS, LLC (Pennsylvania, US), Providence Photonics LLC (US), Powertrol Inc. (US), and TKH Security Solutions (Netherlands).